Istio is the new cool kid on the block. Well, it is the new cool kid on the block over on the street with all the houses just starting to be built. It’s new, really new. And even better, it just hit 1.0! What is Istio? Why should I care? You should care because Istio adds a lot of features to your Kubernetes Cluster that you’re going to want. However if you don’t know what Istio is or why you should care I recommend going and reading the official documentation on Istio. They do an amazing job spelling it all out in real terms you can understand. Assuming you read about Istio or already knew it is important, let’s focus on the purpose of this article, how to install Istio on Google Kubernetes Engine right now. I say right now because the Google Cloud folks are hard at work creating a managed instance of Istio. When this comes out it is likely that with just a command or two you’ll add Istio into your already running Kubernetes Cluster and gain some of the benefits. For now, let’s look at the easiest way to integrate Istio into Google Kubernetes Engine (GKE). If you are unsure of what Kubernetes is, why it is important, or just getting started with Kubernetes, this isn’t the article for you. I recommend going and checking out my other posts on Google Cloud Platform (GCP) and GKE. First thing we will need to do is setup a Kubernetes Cluster in your Google Cloud Project. As with other articles I’ve written, I have created some scripts that you can run in your Google Shell environment to make this process super painless. The following command will create a new Kubernetes Cluster and then install Helm/Tiller into your Kubernetes Cluster with TLS. If you have questions about how we setup these files I’ve included links to other articles that explain these steps along with links to the code in these files. Again, this isn’t the main purpose of this article so I’m trying to get to the new stuff quickly. The first thing we need to do is download the Istio code into our environment and add Istio into our Command Line Environment. There are many ways to do this that I’ve seen across a variety of posts around the web. As always I’m going to show you the quickest, most direct way to make this happen. You can enter the following commands into Google Shell to download Istio. With Istio downloaded and installed on your Path we can move to the next step and install Istio into our Kubernetes Cluster. There are many ways that you can install Istio covered by the Istio documentation. I am focusing on using Helm for this installation because I feel it provides you the easiest way to install while also giving you the most features. On top of that, with Istio now hitting 1.0, Helm is the recommended way to install Istio in a Kubernetes Cluster by the Istio maintainers. We will be able to do all of this with one line, however I am including some tweaks to the Helm install to include Grafana, ServiceGraph, Tracing, and Kiali, along with Mutual TLS Authentication. These values aren’t enabled by default but they will be required by most project’s you’ll come across. The following line will complete the install. Once you run this the installation process will begin. There isn’t a log of logging that happens so you might think that nothing is happening. After about a minute or two you’ll see the process complete and then we can get to validating that everything is installed correctly. There are more settings you can play with as part of the Helm install. These are just some that I found were important to have. I recommend checking out the documentation to see all of the options you do have. If you’re lazy and don’t like typing then I’ve created a bash script to handle the download and install for you. With the download and install complete it is time to focus on validating everything works as intended. 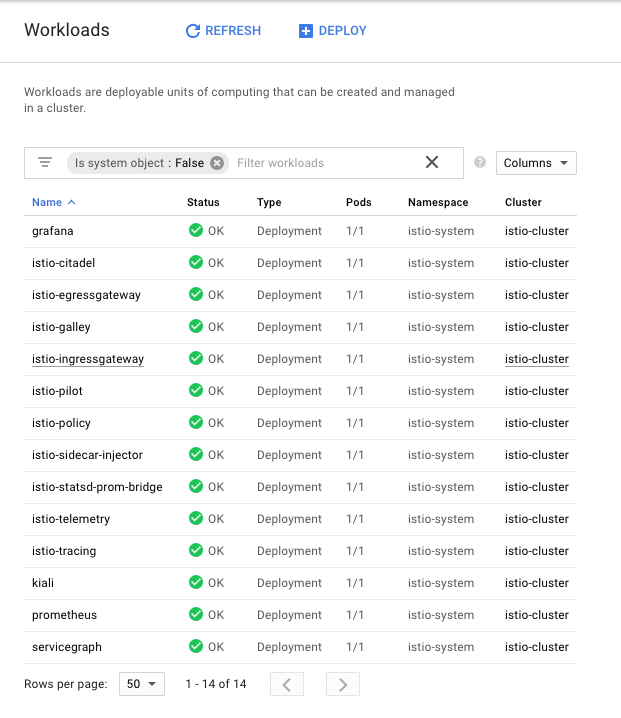 It should be obvious that Istio is installed if you look at your Kubernetes Engine> Workloads view in your Google Cloud Project. However, to confirm that everything is complete we will install a sample project created by the Istio team to ensure everything is setup properly. To do this we can run a quick script to setup and install the sample project. After you run the second script you should see output similar to the following. If you hit the url that is provided you will see the running application, thus proving that everything was installed properly. That’s it! A few minutes of work and you’ll have a Kubernetes Cluster with Istio running and ready for development. There is so so so much further to go and many other features to add, but for now we should be happy with this. Shortly I’ll keep releasing posts that go through the various features built into Istio. Luckily there aren’t that many, but the ones that are there are powerful. Stay tuned! Before you leave make sure to cleanup your project so you aren’t charged for the VMs that you’re using to run your cluster. Return to the Cloud Shell and run the teardown script to cleanup your project. This will delete your cluster and the containers that we’ve built. Questions? Feedback? I’m very interested to hear what issues you might run across or if this helped you understand a bit better. If there is something I missed feel free to share that too. We are all in this together!